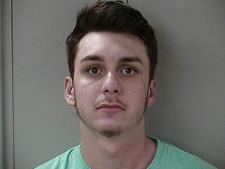 24 Year old Brandon Wiley of Lewisburg, Tennessee was arrested in Murfreesboro and charged with Aggravated Assault with the Enhancement of a "Hate Crime." Wiley was taken into custody after MPD Officers responded to a call at Saint Thomas Rutherford Hospital to meet with a subject who had been "severely beaten," according to an arrest report. The victim had multiple injuries that included several broken bones in his face. Some of those injuries included two broken orbital sockets and a broken nose. From a hospital bed, the victim gave detectives a statement that implicated Wiley. He told police the suspect beat him because he had "Propositioned him." If the victim first grabbed Wiley between the legs, that could be considered a crime. However, authorities say that a video of the incident and earlier activities between Wiley and the victim were not consistent with statements made by Wiley. Therefore, Wiley was arrested and charged with the hate crime related assault.